Want to slow the signs of aging? Want to stop the signs of aging? Want to reverse the signs of aging? Every cell in the body gets its nutrients from blood. This essential fluid carries out the critical functions of transporting oxygen and nutrients to our cells and getting rid of carbon dioxide and other waste products. One of the most important components of blood is red blood cells. Its primary function is to transport oxygen from the lungs to the cells of the body. It contains a protein called haemoglobin, an essential substance that is needed & actually carries the oxygen. 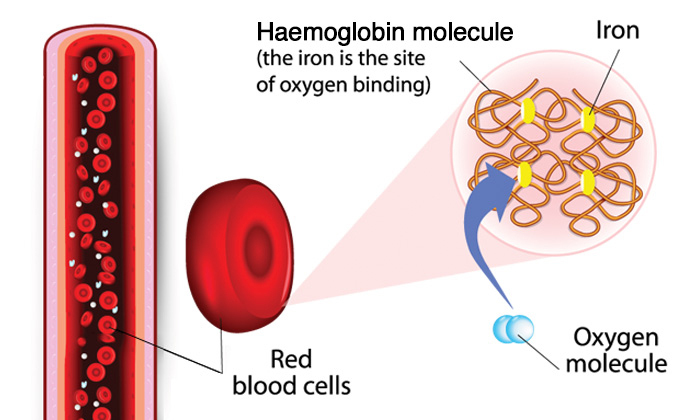 Ninety-seven percent of the oxygen that is carried by the blood from the lungs is carried by haemoglobin. So, how do we ensure our body has sufficient haemoglobin to keep us healthy & enhance our longevity? The answer is SNOWPHYLL – Snow Algae Chlorophyll, an exclusive Chlorophyll superfood specially formulated by Mibelle BioChemistry Switzerland with the powerful combination of Snow Algae Pure & Mulberry Leaf Extract. We can do this by naturally stimulating the Calorie Restriction in our body with Snowphyll – Snow Algae Chlorophyll. Of the various approaches to slow down the aging process, calorie restriction is considered the gold standard. It is now known that caloric restriction increases the lifespan of organisms. But how can can our skin benefit from these insights into the longevity pathway without undertaking a low-calorie regime or an exhausting physical training program? The most marvelous and amazing benefit Snowphyll gives comes from the fact we can naturally stimulate the Calorie Restriction in our body. In addition, its molecular structure is almost identical to haemoglobin except for the centre atom. Thus, it can actually help to do the job of haemoglobin. It helps to rebuild and replenish our red blood cells, boosting our energy and increasing our well-being almost instantly. Chlorophyll has the power to regenerate our bodies at the molecular and cellular level. Over the years of researches, Scientists from Mibelle BioChemistry have found that the main ingredient in Snowphyll – Snow Algae Pure, an extract from the extremophile algae from the Swiss Mountains, consist a potent Phyto substance that mimics the effects of calorie restriction & this way is able to improve the longevity of the cells. These are single-cell algae with the unique ability to actively live at a temperature of approximately 0⁰C. In contrast, most other plants either reduce their metabolic activities or are simply unable to survive at this temperature. Snow Algae grow in areas where there is either an Alpine or polar climate in which there is snow all year round (permanent snow). Thus, these extremophile algae have the ability to thrive in freezing water with very low nutrient levels. Snow algae adapt to their environment by modifying their pigmentation. Pigment concentration change is one of the strategies developed by the snow algae to enable them to adapt to their extreme habitat. This innovative anti-aging ingredient has won the 2014 Europe BSB Innovation Prize Award. Calorie Restriction is a dietary regimen that involves reducing the calorie intake by between 25% – 65%, while maintaining optimal levels of protein, vitamins & minerals. Calorie Restriction has been demonstrated to protect against stress & decelerate the biological aging process resulting in improved healthy span & extended lifespan. Thus, Calorie Restriction is regarded as a promising pathway to slow down the signs of aging. Touted as superfood & the “next known health sensation”, has effective sugar blocking properties that will combat diabetes, cholesterol and heart disease while helping you lose unwanted pounds. Mulberry leaves contain an element called 1-deoxynojirimycin (DNJ) that controls the absorption of glucose and helps to reduce the amount of glucose in blood, which is responsible for managing fats and sugars. chlorophyll, vitamins C, B1, B2, B6, A and fiber. It reduces the binding of carcinogens from foods like cooked meat products that damage the DNA & other organs of the body particularly the liver. Bad breath is caused by oral bacteria that reside in a person’s mouth & it excretes odoriferous waste products. Snowphyll acts as deodorizer that eliminates bad odor & reduces the stringent smell of urine, infected wounds & feces.